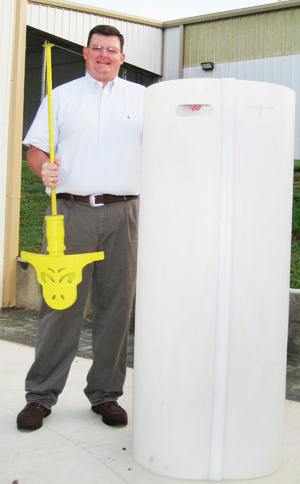 Doug Kingman, with one section of his bulk grain rescue tube, and the tool used to drive it down around trapped grain workers. Doug Kingman calls them the "new face of agriculture." They are city kids who see the need to help out with the growing problem of world food production. They go to colleges like A&M, Purdue, Illinois State, and Sam Houston State, sitting in classes once made up mostly of country kids and dreaming up ways to help solve that problem. When Kingman uses that phrase, he is describing himself. He went to public schools in Baytown, Texas. His dad was from Kansas but came to the Gulf Coast to work in the petrochemical industry. Doug never lost his feel for agriculture, making trips back to Kansas to visit relatives. One day, he said, he simply recognized "a desire to be part of the food production chain. There just wasn't enough food." He went to A&M, then Purdue for advanced degrees, and taught at Illinois State. While at Illinois State he came up with another idea--one that has now proved to be a true lifesaver for one person who was more directly in the food-producing chain than any university professor. Research at a university is often done in areas that are of great benefit to the overall knowledge in that area, but is difficult sometimes for the average person to understand. Then there is the kind of research that Kingman did, which is now credited with saving a life. Kingman is an assistant professor in agriculture and industrial sciences at Sam Houston State University. When he was working on his master's and doctoral degrees at Purdue he studied incidents in which farmers and workers in grain storage facilities sometimes died as a result of being covered with grain. "I investigated several engulfment incidents where better, more efficient rescue devices might have saved a life or two," said Kingman. "I found several very crude devices that had potential, but probably increased the risk of injury to rescue workers as well as the victims." At Illinois State he received a grant to further his research. He came up with an idea and asked the university if he could market it. They said "go for it." "This was a classic example of a faculty member receiving public funds, doing research on a problem, and then legally producing a marketable product that serves the public," said Kingman. He designed a "bulk grain rescue tube." It is manufactured by a company Kingman formed, Liberty Rescue Systems, and sold by a distributor, Mill and Elevator Supply of Kansas City, Mo. According to the distributing company's Web site, the unit consists of "four vertical interlocking units that form a cylinder which is driven section by section into the grain surrounding the entrapped victim (to) allow the grain to be moved so the victim can be safely extricated." The unit, which sells for about $4,500, has been on the market for about a year and a half, and almost a hundred have been sold, Kingman said. On July 10 near Amboy, Ill., one of the devices was used in an actual emergency. "A male grainery worker made a miss-step into an opening at the base of a large steel bin," Kingman said rescuers told him. "As grain flowed in upon him, he was able to call for help." Nearby workers called 911 and were able to place a portion of a plastic barrel around his head and chest until rescuers arrived with the rescue tube. Complicating the situation was the fact that the victim's foot was wedged between the bin floor and a mechanical device. "With the grain pressure held back by the tube, rescue workers were able to dislodge his foot and pull him to freedom," Kingman said. "Thanks to the technical rescue team's knowledge and their advanced level of training, an individual was able to go home to his family instead of his family having to pay their last respects." At Sam Houston State Kingman is involved in biodiesel research, which relates to food production and the broader and also related problem of energy production. But so far, nothing he has done has been as satisfying as inventing that lifesaving device. "It has been a great and emotional experience for me," he said.